To understand a chemical reaction. Take a magnesium ribbon. Clean it by rubbing with sand paper. (a) Why should magnesium ribbon be cleaned before burning in air ? Hold it with a pair of tongs. Burn it in the flame of a burner. Collect the ash so formed in a watch glass. Precaution – Burn magnesium ribbon by keeping it as far as possible from your eyes. (b) What is your inference? (a) Magnesium ribbon (Mg) is cleaned before burning to remove the layer of magnesium oxide, dirt etc. from its surface. It forms when magnesium ribbon remain exposed to moist air. Such layer obstructs burning of magnesium. 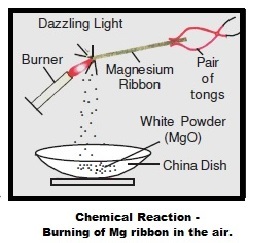 (b) On burning in air, magnesium ribbon gives dazzling white flame and changes into a white powder (magnesium oxide, MgO) as a result of reaction between magnesium and oxygen present in air. Conclusion – This is a chemical reaction as original substance (Mg ribbon) loses its nature and identity.